The 1900 Patriotic Fund issue of Victoria - 1d (1/-) stamp on cover. Genuine use of either of the 1900 Patriotic Fund stamps is extremely difficult to locate. 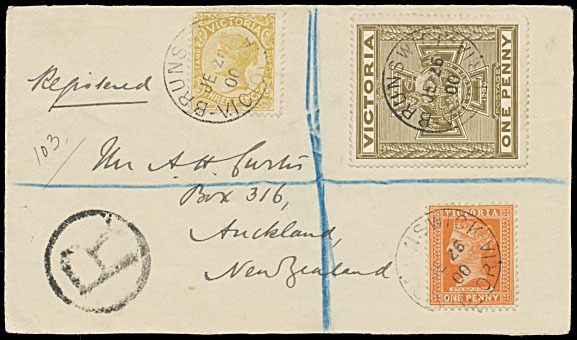 A number of covers bear one of the stamps or both but do not pay the correct rate. There are however some covers which, although perhaps fabricated to some extent, still pay correct rates and also appear to have been through the appropriate postal procedures. There is only one cover recorded with a single Victorian 1d (1/-) Patriotic Fund stamp franking. mixed frankings of both the Victorian 1900 Charity stamps with another issue. 1d (1/-) stamp on First Day Cover (22 May 1900). There is only one set of First Day Covers recorded. They were prepared by Mr. William Rundell who worked in the General Post Office building. Prestige Philately May 2007 Lot 577 and April 2011 Lot 522. The 2d FDC is shown elsewhere. Covers with a single franking of the 1d (1/-) stamp. Covers with a mixed franking of the 1d (1/-) stamp.. Both of the covers shown below have their counterparts with the 2d (2/-) stamp attached. 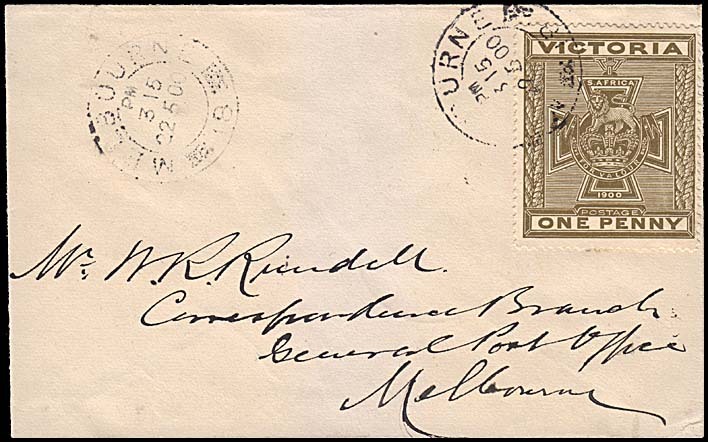 5d inter-colonial registered letter rate. Prestige Philately May 2004 Lot 1073. Prestige Philately June 2010 Lot 690. 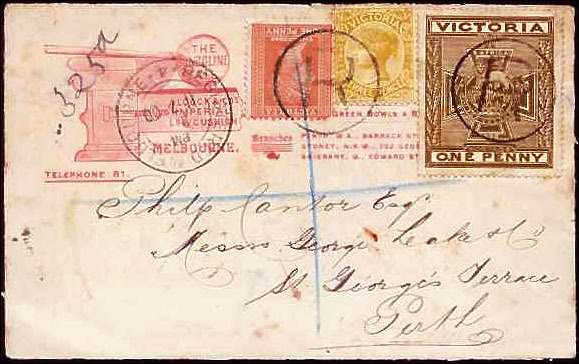 This cover - and its companion with the 2d (2/-) Boer War stamp - is on a cover advertising Alcock & Co., Billiard Table Manufacturers of 212 Russell Street, Melbourne. Alcock is credited with bringing the game of billiards to its high level of popularity in Australia during the 1800s. Registered cover front - so no arrival backstamp. Prestige Philately June 2010 Lot 687.